During a quiet midnight, where they were floating together as usual from centuries. They decided to leave even before the sunrise! Over the Adriatic Sea a fateful conversation took place between the leaving whale and lion, while the good witch was listening and watching them carefully. 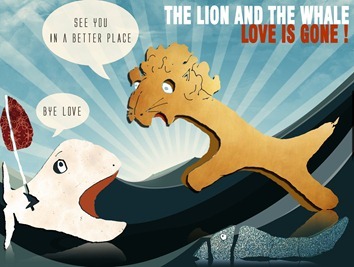 The Lion: After all these years we suddenly decided to leave?! together for many years ago. “Our Integration and love”. We can’t stand this horrible situation anymore. We may have no future! order to save our strong relationship?! After a moment of silence, while they were preparing to leave. The good witch has just decided to offer help! In which she will be creating their new nest surrounding both. That wall will preserve their future relationship from any coming threats (Aqua Alta and the everyday cycle of tides) their true enemy. The temporary solutions… (They aren’t solving the main problem till now). Therefore, our vision in the new proposed solution will be visualized as a huge chain surrounding old Venice ,the same idea in ancient cities (the wall surrounding the city from Egypt to china protecting the cities from enemies; in our case will be the water) .and it will be playing the main role in protecting Venice from the several tides coming from the three lagoon inlet channels which keeps threatening its existence. So it will be as a living dam, . and it will be built over the years step by step as Venice was built. The new chain surrounding old Venice will reserve the higher water level, preventing it from sweeping to Venice and maintaining constant water level inside Venice. 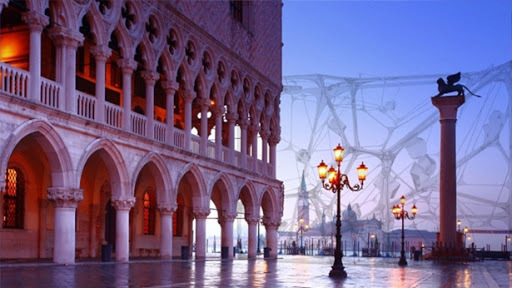 The new chain will be composed of a transparent Voronoi wall, this wall will be including the residential units, public and commercial spaces, tec., which provide the essence of a true city living (New Venice). 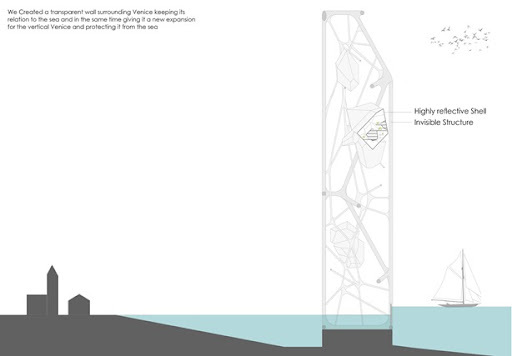 (And these residential units will attract the venetians fugitives from the continuous rise in the standard of living at old Venice).While the structural skin will be primarily of semi-transparent frames following a cell-like pattern. 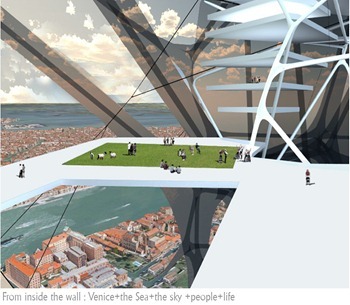 This transparent Voronoi wall will keep the same field of vision opened around old Venice. And simply showing what’s behind: the sea and Venice. 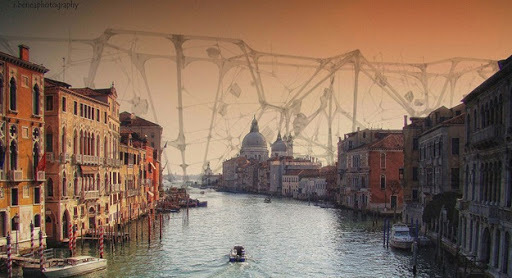 This contradiction between the chain and the old Venice will make a unique combination; will make a city that will live forever in peace and beauty.